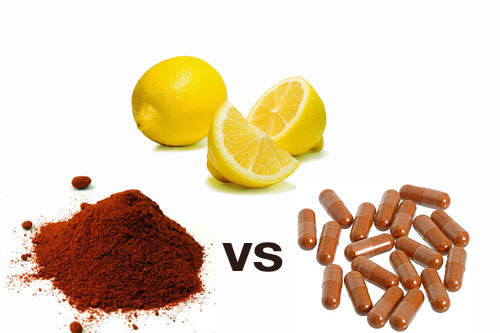 When doing the Master Cleanse Diet or Cayenne Pepper Diet, many cleansers commonly ask the same question. Is it alright to substitute cayenne powder for cayenne pills and, if so, how many cayenne capsules/pills should I take? The short answer is, “Yes, it is ok.” It is the same substance in a different form. Your body will digest the cayenne spice the same way, whether it is in powder or pill form. You are receiving the same amount of nutrients that you would be if you were using the powdered cayenne in your Lemonade Diet. As for how many cayenne pepper pills or cayenne capsules you should use when doing the Master Cleanse Cayenne Pepper Diet, below is an estimated conversion. Understand, milligrams -mg listed on your cayenne pill bottle- describe a unit of weight, whereas teaspoons -or tsp- represent a unit of capacity / volume, so the density of the substance is important when converting a substance from milligram to teaspoon. For instance, unrefined sugar = approx 4.2 grams (4200 mg) per teaspoon, and water = approx 5 grams (5000 mg) per teaspoon. However, cayenne powder is much lighter than either of these substances. 1 average tsp of cayenne powder is the equivalent of 2000 milligrams. The Lemonade Diet recipe calls for 1/10 tsp cayenne per serving, so 1/10 x 2000 mg = approx 200mg a serving. This equals about half of a 500mg cayenne capsules per glass or one 500 mg cayenne pepper capsule every other glass. In conclusion, 4 Cayenne Pills a Day are recommended for the Lemonade Diet. You can take more or less depending upon your preference… up to 8 – 500mg cayenne pills a day can be used. This entry was posted on Monday, September 13th, 2010 at 12:13 pm	and is filed under Lemonade Diet Blogs. You can follow any responses to this entry through the RSS 2.0 feed. You can leave a response, or trackback from your own site. That is debatable. Some studies suggest that both good and bad bacteria are affected. However, in a short term 7-10 day cleanse, any good bacteria that may be lost can be easily gained back. Taking probiotics is a big help and will regulate gut flora in the intestines after cleansing. Some people have better experiences digesting cayenne capsules. You may want to substitute powder for capsules. Are you positive this wasn’t due to another underlying issue? When your body is ridding itself of toxins, certain symptoms may appear. Drinking more water in addition to the lemonade beverage can help flush the waste out of your system at a speedier pace. can i drink anything else if i get thirsty while on the diet? ie.. unpurified water or should i just stick to drinking the lemonade whenever i get thirsty? You are free to drink as much purified or spring water as you want in addition to the lemonade beverage. Can you eat salad while on the diet or have a glass of white wine? It is recommended that you only consume the liquid ingredients that are outlined in the Master Cleanser. Unfortunately, salad and wine are not included. The purpose of this cleanse is to detoxify the body of the pollutants it has been accumulating over months or years, as well as, give the digestive system a rest. When you are absorbing food and alcohol that inhibits the effects of the cleansing process. Can I substitute herbal lemon or mint tea for the sea salt drink? I plan on starting my 10 day tomorrow. I hope I lose weight an feel tons better! Can I substitute herbal lemon tea or mint tea for the sea salt drink? I plan on starting my 10 day cleanse tomorrow. I hope I shed some weight an feel better! When at all possible, only fresh lemon juice should be consumed. In the case it is organic premade lemon juice, and you have read the list of ingredients on the label which do not show any preservatives, you should be okay. However, as previously stated, fresh lemons are always advised. Some individuals choose to replace the salt water flush with the herbal laxative tea. It is recommended that when possible, the flush be taken as it thoroughly cleanses the digestive tract.